A mix of everything: Japanese couples may have traditional Shinto ceremonies, then head for a Western-style wedding party. In the first part of this article, I discussed the five ways proposals and engagements are different in Japan. But what about weddings? From the simplest procedure you can imagine to elaborate celebrations, tying the knot here covers a surprisingly wide range of interesting procedures. In a bid to find out more about how wedding ceremonies and marriages are done in Japan, I spoke to six Japanese friends about their personal experiences and general observations, and as usual, there were a few fundamental differences. Once a proposal has been accepted, couples in many Western countries usually set about planning a wedding. In Japan, however, this step is optional. My friend Ibuki got engaged to her now-husband soon after they got together, and a year later they simply went down to the city office, filled out a form and voila – officially married. When I heard this, I was gobsmacked. In most Western countries, even the most minimal wedding still requires a short ceremony with an officiant and two witnesses. In Australia, you have to give one month’s notice of your intention to marry and book a time slot at the registry office. All of this naturally leads to people putting on their finery, buying a bouquet, maybe inviting a few guests. This is as low-key as a wedding gets in the West. But here, it is possible to be entirely no fuss when it comes to getting hitched. Not common at all, usually more people at the do afterwards. 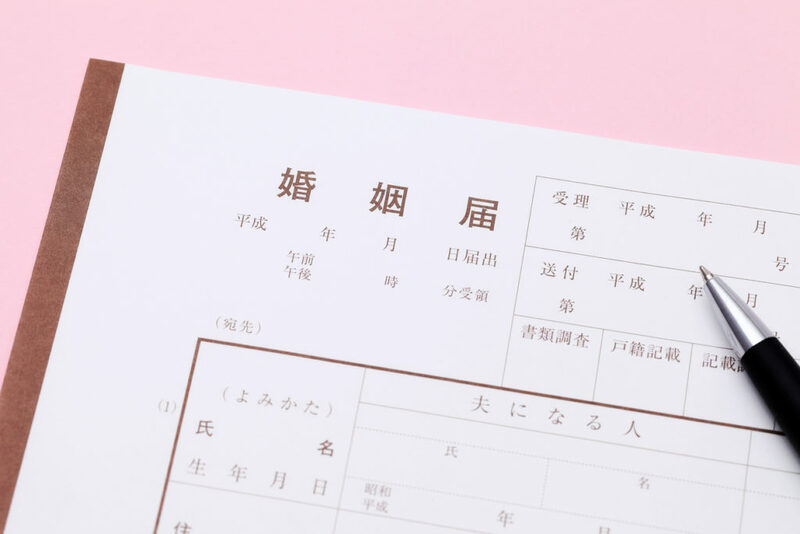 Regarding 1., yes in Japan, you get married by filing a "kouin todoke", the pictured document, at the ward office. Any ceremony you have, whether Shinto, Christian or whatever, is merely for show. Unlike some countries in the West, you are completely free to have the ceremony where you like and with whatever words you want. The ceremony itself in Japan has no legal meaning. You will still have to go and file the official document to get married. For this reason, Japanese people refer to legally getting married as "seki wo ireru". It may be done before or after any ceremony you have. If you don't do it on the same day, and many don't, you will end up with a wedding anniversary that differs to "the day you got married". Forgot to mention the 'breaking-even side': planning for money-gifts to equivocate with the cost of the wedding. My nephew recently had nuptials costing around 5,500,000 just for the reception (God knows what for the ceremony) just to break even. Say 100 guests, that is 50,000 yen each on average. We paid about two thirds of my monthly salary - not my plan! Still no reason to get married anytime soon.